When Normal Fasting Blood Glucose Results Aren't Necessarily "Fine"
When people have a fasting blood glucose test and the results come back normal, they’re told (or assume) that everything’s fine. But is it? Certainly, a fasting blood glucose test is the least expensive test to find out if someone is already pre-diabetic, but for those wanting to avoid becoming Diabetic and to lower their risk of the other chronic disease associated with Type 2 Diabetes and high levels of circulating insulin (called hyperinsulinemia) noticing abnormalities in how we process carbohydrates is essential and these changes are estimated to take place a decade before our fasting blood sugar begins to become abnormal. Our bodies have to maintain the glucose (sugar) in our blood at or below 100 mg/dl (5.5 mmol/L) but each time we eat or drink something other than water or clear tea or coffee, our blood sugar rises as our body breaks down the carbohydrate in the food from starch and complex sugars to glucose, a simple sugar. Eating causes hormones in our gut, called incretin hormones to send a signal to our pancreas to release insulin, which moves the excess glucose out of our blood and into our cells. When everything is working properly, our blood sugar falls back down to a normal level within 2 hours after we eat (called 2 hours “postprandial”). If we’re healthy and don’t snack after supper, our blood sugar falls to a lower level overnight but that too is maintained in a tightly regulated range between 60 mg/dl (3.3 mmol/l) and 100 mg/dl (5.5 mmol/l). During the night and as we approach morning, our body will break down our stored fat for energy and convert it to glucose in a process called gluconeogenesis. When we have a fasting blood glucose test, it measures our blood sugar after we’ve fasted overnight and when we’re healthy, the results will be between 60-100 mg/dl (3.3-5.5 mmol/L). If it is higher than 100 mg/dl (5.5 mmol/l) but less than 125 mg/dl (6.9 mmol/L) we are diagnosed with impaired fasting glucose, but what if it’s normal? Is a normal fasting blood glucose test result enough to say that we’re not at risk for Type 2 Diabetes? No, because a fasting blood glucose doesn’t tell us anything about how our body responds when we eat. A 2-hour Oral Glucose Tolerance Test (2 hr-OGTT) may be requested for people whose fasting blood glucose is impaired (higher than 100 mg/dl / 5.5 mmol/L) in order to see if it returns to normal after they consume a specific amount of glucose (sugar). If their blood sugar returns to normal (less than100 mg/dl / 5.5 mmol/L) 2 hours after drinking a beverage containing 75 g of glucose (100 g if they’re pregnant) then the diagnosis remains impaired fasting glucose because it is only abnormal when fasting. However, if the results are greater than 140 mg/dl (7.8 mmol/L) but below 200 mg/dl (11.0 mmol/L), then they are diagnosed with impaired glucose tolerance which is called “pre-diabetes“. If the 2-hour results are greater than 200 mg/dl (11.0 mmol/L), then a diagnosis of Type 2 Diabetes is made because their fasting blood glucose is > 7.0 mmol/L (126 mg/dl) and their 2-hour blood glucose is > 11.0 mmol/L (200 mg/dl). But what if their fasting blood glucose is normal? Does that mean everything’s good? No, because we don’t know what happens to their blood sugar after they eat carbohydrate containing food, most notably between 30 minutes and 60 minutes. A 2016 study looked at blood sugar and insulin response from almost 4000 men aged 20 years or older and 3800 women aged 45 years or older who had a 5-hour Oral Glucose Tolerance Test using 100 g of glucose. The study found that 53% had normal glucose tolerance; that is, they had normal fasting blood sugar and did not have impaired glucose tolerance (IGT) 2 hours after the glucose load. Of these people with normal glucose tolerance, 75% had abnormal blood sugar results between 30 minutes and 1 hour. A little less than 1000 people (990) out of the total with normal glucose tolerance (4030) had a normal glucose pattern (see graph below). It’s easy to see that the blood sugar rises to a moderate peak and then decreases steadily until it’s back to where it started from at 2 hours. This is what blood sugar is supposed to do. Almost the same number of people (961) as had normal glucose curves showed early signs of carbohydrate intolerance which can be seen most noticeably between 30 and 60 minutes. Keep in mind, this graph represents the average blood sugar response of these individuals. These folks had normal fasting blood glucose but after 2 hours blood glucose did not return to baseline but was not high enough to meet the criteria for impaired glucose tolerance. Unless someone was looking between 30 and 60 minutes, no one would know it not was not normal. Rather than blood glucose going up to a moderate peak and then falling gradually in a straight line, a two-stage rise in glucose can be clearly seen between 30 minutes and 60 minutes before beginning to drop. A little more than 1200 people (1208) had the following abnormal glucose response which represents Advanced Carbohydrate Intolerance. 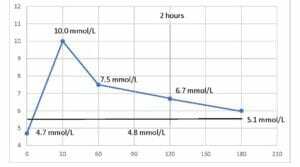 These people had normal fasting blood glucose, but their blood glucose did not fall to baseline at 2 hours but was below the cut-offs for impaired glucose tolerance. Between 30 and 60 minutes their blood sugar went slightly higher at 60 minutes than at 30 minutes compared to the Early Carbohydrate Intolerance curve, before beginning to fall. Slightly more than 800 people (807) had an abnormal glucose response curve shaped as follows, indicating Severe Carbohydrate Intolerance. They had normal fasting blood glucose and 2-hour postprandial blood glucose results that were higher than at baseline yet did not meet the criteria for impaired glucose tolerance. What was significant is that blood sugar was significantly higher at 60 minutes than at 30 minutes, compared to the Advanced Carbohydrate Intolerance curve. The results of this study show that even if fasting blood glucose is totally normal and 2-hour postprandial blood glucose does not meet the criteria for impaired glucose tolerance, it often does not return to baseline and the blood sugar response between fasting and 2 hours is very abnormal. 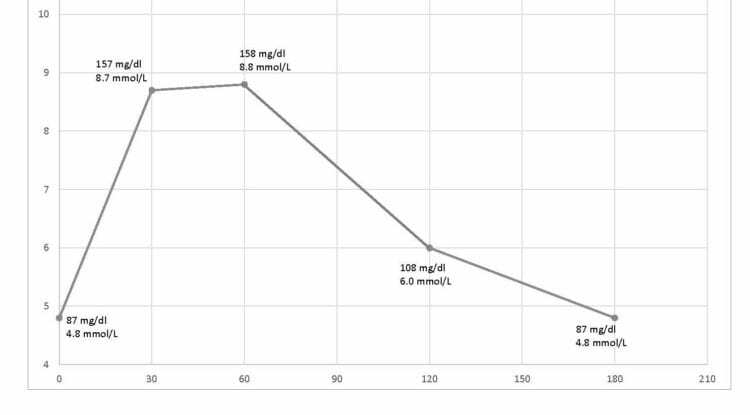 What can’t be seen from these graphs is what happens to the hormone insulin at the same time. This will be covered in the next chapter but suffice to say that Normal Carbohydrate Tolerance, blood sugar response mirrors what is happening with insulin but in Early, Advanced and Severe Carbohydrate Intolerance, insulin secretion is both much higher and lasts much longer. This is called hyperinsulinemia (high blood insulin) and contributes to many of the health risks associated with Type 2 Diabetes, including cardiovascular risks (heart attack and stroke), abnormal cholesterol levels and hypertension (high blood pressure). This is like having “silent Diabetes“. As a Dietitian, when a person’s clinical symptoms and risk factors warrant it, I’ll request a 2-hour Oral Glucose Tolerance Test (2-h OGTT) with an extra glucose assessor at 30 minutes (and sometimes at 60 minutes) to determine how their glucose response compares to the above curves. While these blood tests are done with 75 g of glucose and not 100 g, the shape of the curves and the endpoint as well as the size of the peak between 30- and 60-minutes reveals much about their carbohydrate intolerance. Since these people have normal fasting blood glucose test results, a request for an Oral Glucose Tolerance Test (with or without the extra glucose assessor) is often declined as a “waste of healthcare dollars”. Unfortunately, this is where being “penny wise” can be “pound foolish” as these people don’t know they are at risk and as a result, are not motivated to change their eating habits or lifestyle. What About Glycated Hemoglobin (HbA1C)? 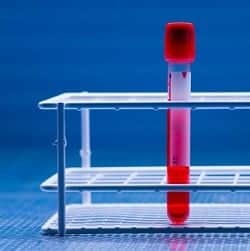 A glycated hemoglobin test (HbA1C, also called A1C) measures a form of hemoglobin that binds glucose (the sugar in the blood) and is used to identify the person’s three-month average glucose concentration because blood cells turnover (get replaced) on average every 3 months. While having a glycated hemoglobin test and a fasting blood glucose test is better than only having fasting blood glucose, it will still miss a significant percentage of people who are able to control their sugars between meals and overnight but who have significant spikes between 30 minutes and 60 minutes, immediately after eating carbohydrate-based food, but that return to normal by 2 hours. 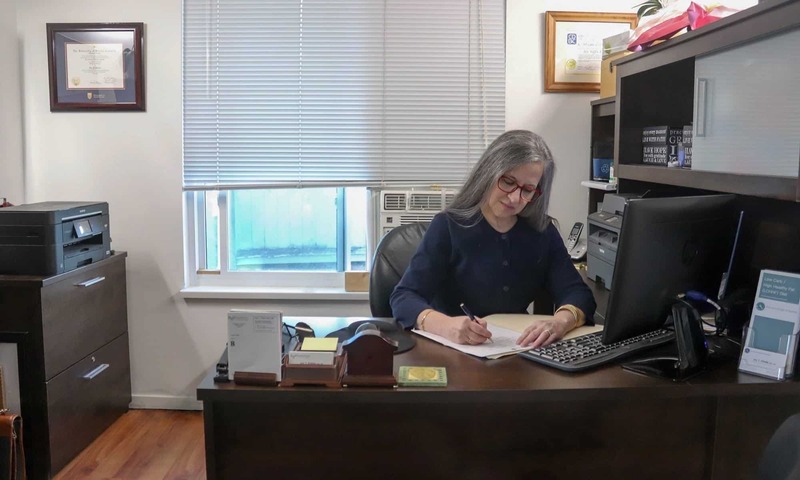 Most physicians will not requisition a HbA1C test if a person’s fasting blood glucose is normal, and even if they do, that test may miss that glucose ever spikes at all between 30 minutes and 60 minutes. In the absence of available lab testing, I sometimes resort to using a Glucose Response Simulation. A simple, if somewhat crude means of assessing glucose response under a load can be done at home using an ordinary glucometer (a meter for measuring blood sugar) such as would be used by people with Diabetes, and either a 100 g of dextrose (glucose) tablets available at most pharmacies or the equivalent. As part of the services I provide to my clients, I work with those that want to do this type of estimate so that they can understand whether they fall into the 75% of people that have normal fasting blood sugar and do not have impaired glucose tolerance at 2 hours postprandial but do have an abnormal glucose response. I explain how to prepare for the test, step by step instruction for conducting the test and then I graph and analyze the data then teach them what the results mean. These results are very helpful as firstly they help people understand the reason for reducing their carbohydrate intake over an extended period of time, in order to restore insulin sensitivity and insulin secretion. These results also enable me in time to individualize their carbohydrate intake once they have reversed some of their metabolic response, based on their own blood sugar response to a specific carbohydrate load. In time, some of these individuals may want to add some carbohydrate back into their diet in small quantities, so with this information, I can guide them to test a standard size serving of rice, pasta or potato compared to their own blood glucose response to 100 g of glucose. 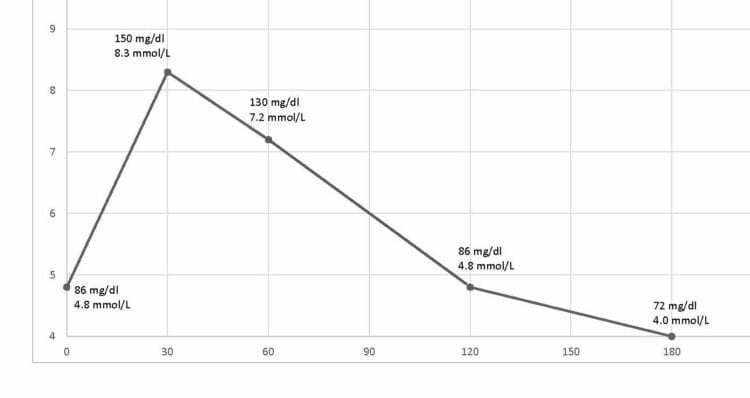 Below are three curves that I’ve plotted from individuals that used the same type of glucometer (Contour Next One) and a standard 100 g glucose load as dextrose tablets or equivalent to 100 g of glucose . I provided each one with identical instructions on how to run this simulation, how to collect the results and ensured each one understood. 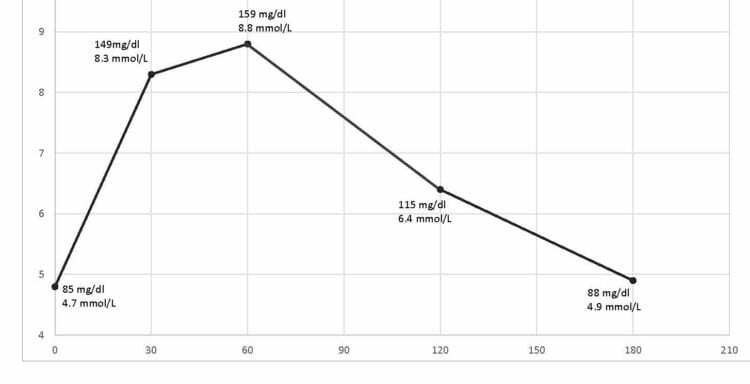 Example 1: The person below had a single glucose peak (similar to the early carbohydrate intolerance of the first abnormal curve, above) but blood glucose did not come back down to the fasting level even after 3 hours. 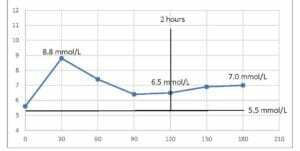 Example 2: The person below had a single glucose peak that reached abnormally high levels and that didn’t fall continuously downward but slowed, then dipped below baseline at 2 hours (mild reactive hypoglycemia) and that gradually came back to baseline over the following couple of hours. Example 3: This person had a similar initial rise as the person above, but no hypoglycemic dip however, this person’s glucose didn’t fall to baseline until almost 5 hours. An abnormal fasting blood glucose test may warrant further testing; however, a normal result is frequently dismissed as being a sign that “everything’s fine”. Data from this study indicates that as many as 75% of people with normal fasting blood sugar may have abnormal glucose responses and associated hyperinsulinemia, meaning they could have the same risks to other chronic diseases as someone who has already been diagnosed with Type 2 Diabetes. They simply don’t know it. With reliable and relatively inexpensive glucometers, as well as continuous glucose monitors (CGM) people don’t need to wonder whether they have an abnormal glucose response to eating carbohydrate (are carbohydrate intolerant). They can use simulation tests, such as the ones I did above, to find out. Not knowing one is at risk does nothing to provide motivation to make dietary and lifestyle changes, but knowing one has an abnormal response to carbohydrates not only enables people to want to make these changes, it also helps them to find which carbohydrates they can eventually add back into their diet, once they’ve lowered their glucose and insulin levels, and in what quantities. If you have questions as to how I can help you get started in knowing your own glucose response and to lower risk factors, please send me a note using the Contact Me form located on the tab, above. Note: The second article in this series explains what hyperinsulinemia is and why it’s a problem. It’s titled Carbohydrate Intolerance & the Chronic Disease Risk of High Insulin Levels and can be read by clicking here.